Saying no seems impossible at times. It’s just easier to do it than fight it. The problem is you then become overcommitted, stressed, and feeling bad about yourselves. When did NO become a bad word? Ah, when you looked at those you loved and didn’t like to see the disappointment on their face. Or the argument that would ensue because of disagreeing with someone. Or the time it would take to make them do it vs. just doing it yourself. No is about you not them. Giving and giving to make others happy just never works. It’s a temporary fix to a long-term issue. Saying no to the things we don’t want, the things that cause us stress, the things that don’t feel right, is a way to say YES to yourself. Flip the no to a yes to yourself. Everyone deserves a yes! You deserve a yes to yourself. Even moms deserve to honor yourself! Being able to connect to what feels right to you is vital to getting to your yes. Saying no is about not hurting people’s feelings. That is the core belief in people pleasing – that it is easier to hurt yourself vs. potentially hurt someone else. You gladly take the stress, the anger, the frustration vs. letting someone take responsibility for their actions. Your children can do for themselves and should do for themselves. If they are teenagers, they can do a lot around the house. Do you do it because you would rather not have the pushback from them? I did!! The thought of the potential fight made me take on a lot of stuff I didn’t want to do. I suspect you are the same. You do it because you don’t want them upset with you. The problem is, you are worn out, and they think everyone is here to make their life easy. Harsh reality will meet them when they move out. Our ultimate goal as a mom is to make independent adults. To have them live on their own. Teaching them to do for themselves is what you want. The hope you have is they won’t go too far if you are important to them. The problem is, you can’t control them by being useful. You are hurting yourself and their growth that way. It’s okay if your children aren’t always comfortable!! You may also need to practice saying no to all the other people in your life. You do not have to volunteer for everything. You don’t have to go to every lunch. You don’t have to buy every product. You don’t have to do stuff that you don’t want to do! Decide what you do have to do – pay bills, follow the laws – but also the stuff you currently do that you don’t want to do. What responsibilities did you accept that you know make you do not enjoy doing? Drop those!! Being busy does not make you important! Yes, that is tough to hear, but it’s the truth. Our importance is not in how much we do. Our importance, worth, is because we ARE. Stop filling your calendar with meaningless busyness that only makes you busy vs. happy. Start putting you on your calendar. What makes you happy? – Just hanging out at home? Put those on your calendar and say NO to the million requests, spoken or unspoken, that you previously have said yes to! 1- Sit with your emotions before you answer. Many times you feel obligated to say yes, and you do so before you think about it. Stop, tell them you will get back to them and then really sit with how the request makes you feel. Is it something you want to do? If not, say no. Honor what YOU feel and do it. 2- Create appointments on your calendar for stuff you want to do! Start putting the stuff you do want to do on your calendar, whatever that is! You can add, Take a Bath, Go for a Walk, Learn something. The critical step is to schedule you in your day!! When you get the random request to do something, check and see what fun stuff you have planned. Hear yourself saying no. Say it out loud. Practice!! You will be asked to do something that you normally would say yes to. Having practiced saying no will help you be ready. Break the habit of saying sure when asked to do something. 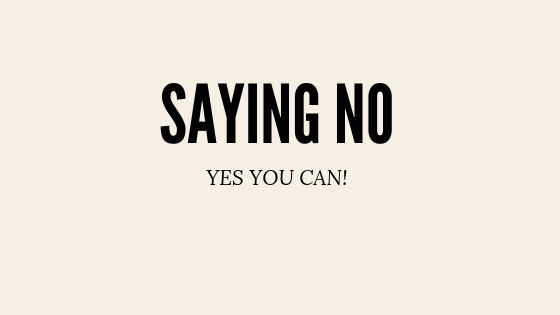 Look at yourself in the mirror and practice saying no! !